After making my paniers and confirming they weren't the right shape, I knew that I needed to make a bumroll or rump. These mysterious items have relatively little documentation or extant garments for us to study. Luckily, Kendra at Demode Couture re-published her wonderful Foundations Revealed Late 18th Century Skirt Supports article on her blog, making it free for everyone. I highly recommend reading it all. 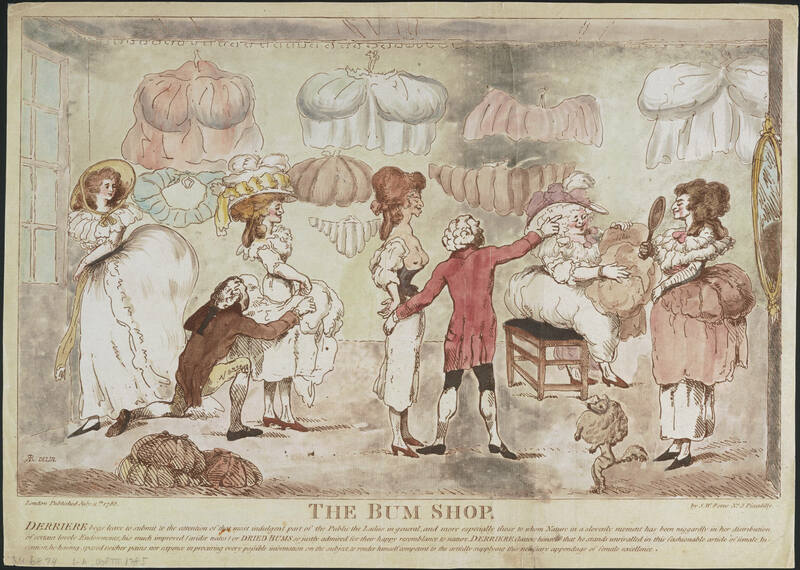 The rump that I liked best was #5, based on the satirical print "The Bum Shop". 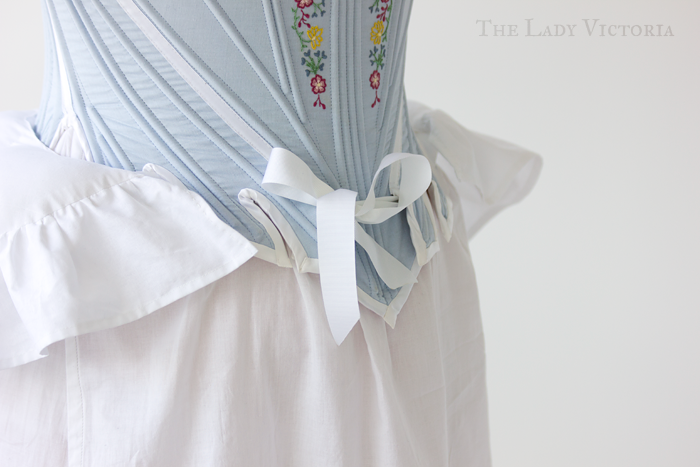 The Bum Shop rump was also very similar to Rococo Atelier's 1780's bumpad, whos size and shape I really liked. This post isn't really a tutorial, more of a step-by-step guide since I hadn't found any blog posts that showed the making of a bumroll. The first thing I did was put on my chemise and stays, and measure. I knew I wanted a really big rump, so I measured from the center back of my waist down to about the top of my thighs. 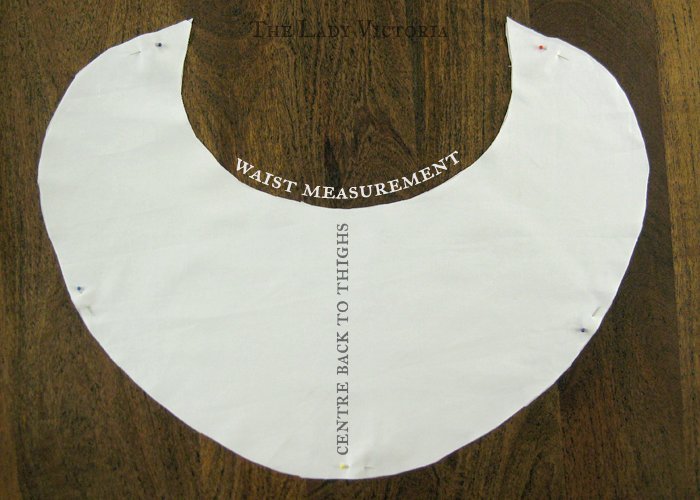 For my waist measurement I measured from the front of one hip, around my back, to the front of my other hip. It's not a full waist measurement, more like a 3/4 one. I drew out a semi-circle that matched my waist measurement, found the center, then drew a perpendicular line that matched my center back to thighs measurement. I then drew the rest of the crescent shape freehand, making sure to have some fullness at the hips. Cut out 2 of these shapes. 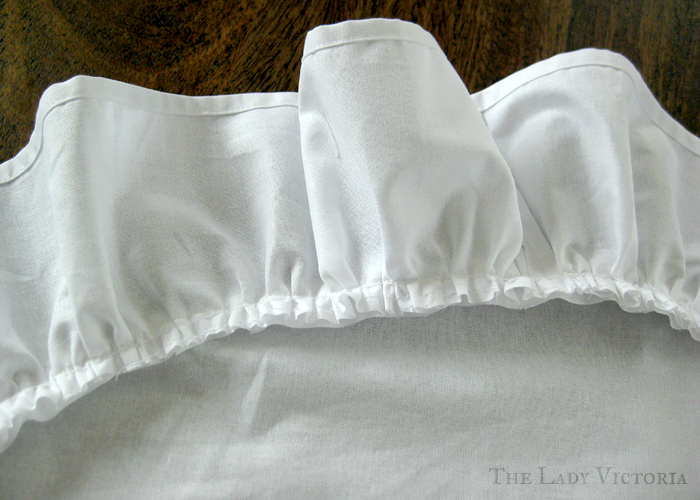 To make the ruffle I measured the outside of my crescent and doubled it. 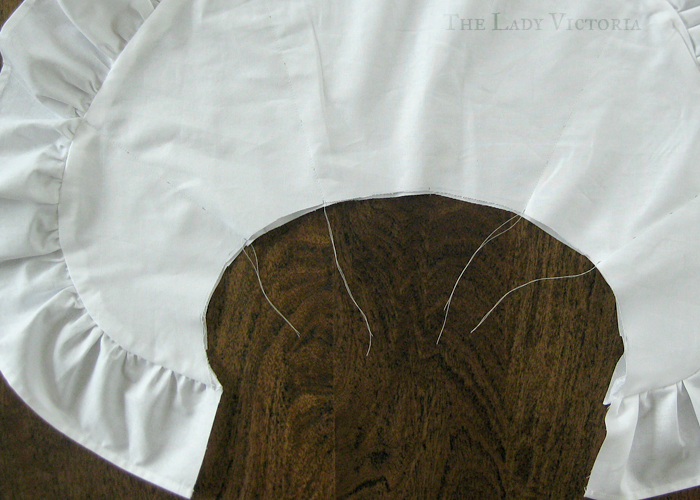 Depending on how full you want the ruffle to be, you can double or triple your measurements. 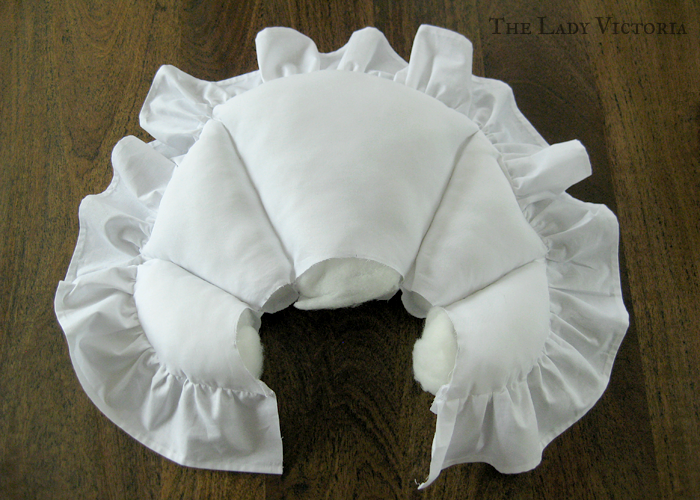 I made the ruffle about 4 inches thick. 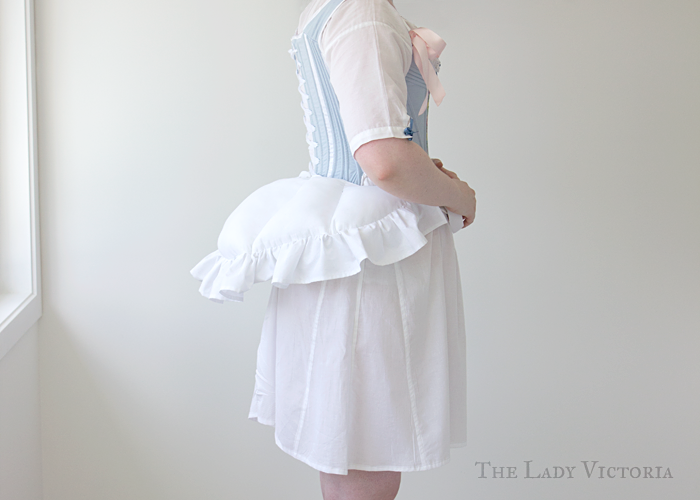 The ruffle is the key to getting the skirts to lay nicely over the rump. Without it, there's a risk of it looking like a shelf instead of a nice smooth shape. 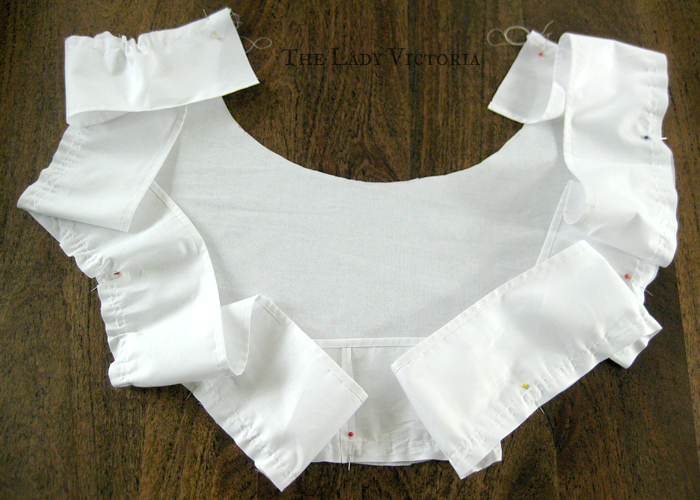 Gather the ruffle with two rows of long stitches, then pin it to one of the crescents. I marked the center back and matched that with the middle of the ruffle, then matched the two ends. I find that having less matching points is easier, as the pins tend to get in the way when you're gathering. 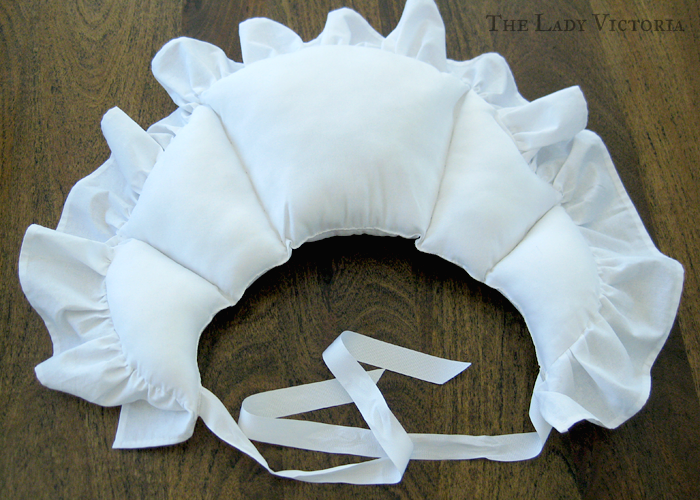 Once gathered, I stitched the ruffles to the crescent. 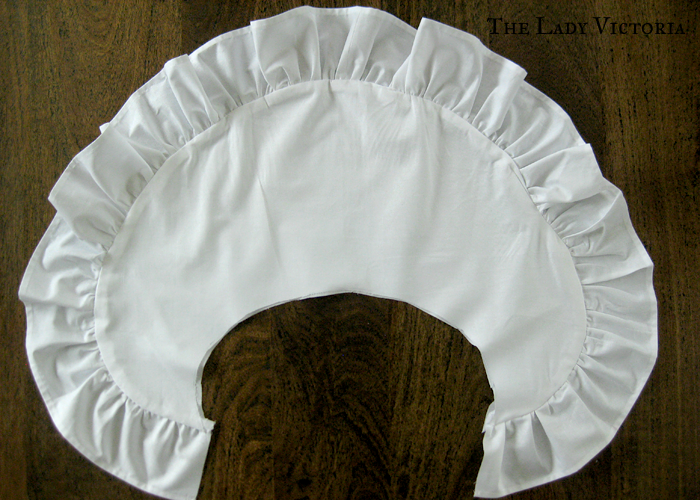 Then I pinned the other crescent to the wrong side of the one with the ruffles and stitched around the edge. Turn it inside out and you should have a rump ready for stuffing. Before stuffing, I added the rows of quilting stitching. These were four straight rows of stitching through both layers of fabric, arranged in a fan shape to form five sections of the rump. I'm not sure what the purpose of the sections are, perhaps it was to cut down on the amount of materials needed for filling the rumps. It doesn't seem to do anything major to the shape. In the picture above i've overstuffed the rump. When it came to stitching it closed, there was far too much stuffing to do it easily. The resulting shape probably wouldn't have been very nice either, it would have ended up looking more like a shelf than a gentle curve. After removing some stuffing, I got lazy and whip stitched the edges closed, leaving an ugly seam. To neaten it up I'd suggest slip stitching. 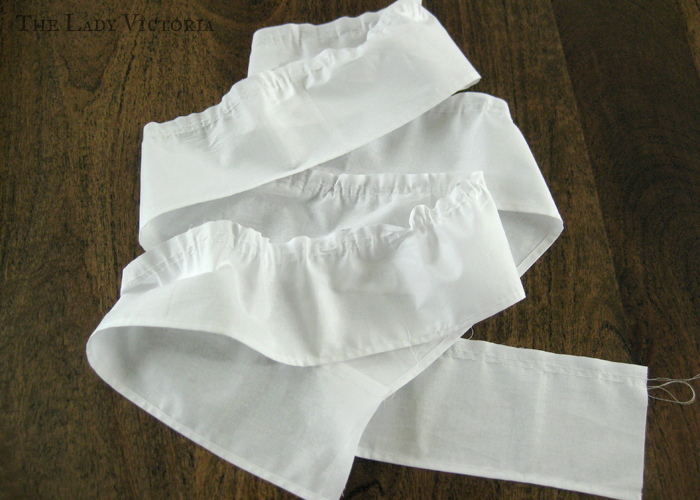 The waist ties are 1/2m of grosgrain ribbon sewn into the points of the crescent. None of the materials or techniques are accurate. 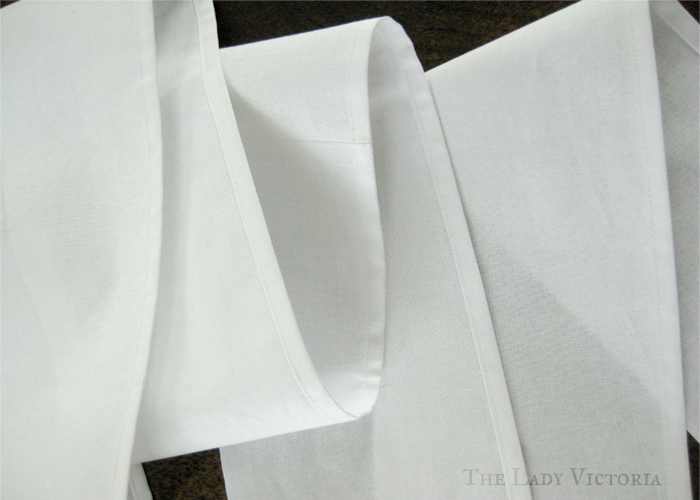 The fabric is a mystery fabric I use for muslins, most likely a cotton/poly blend. The stuffing is polyfill, the ribbons and thread are polyester and everything except the whip stitching was machine sewn. I'm really pleased with the shape it gives, and the overall size. I deliberately went for an oversized, over-ruffled look to make sure I got a nice and striking silhouette. 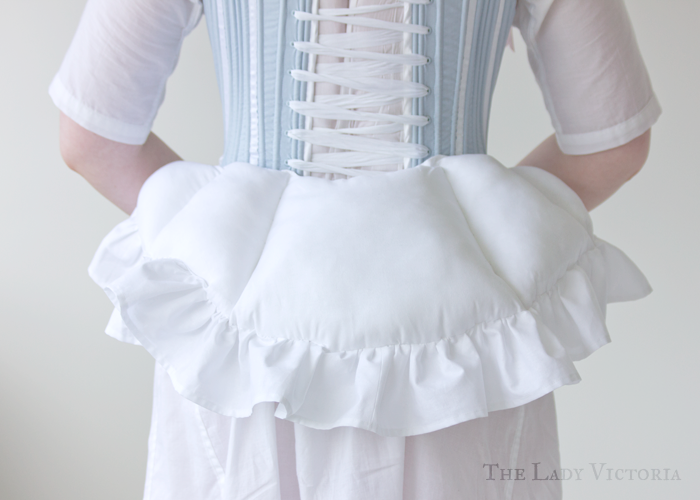 One nitpick is that the sides don't come as far forward as I would have liked, which can cause an odd looking shape under petticoats where the hips suddenly stop. 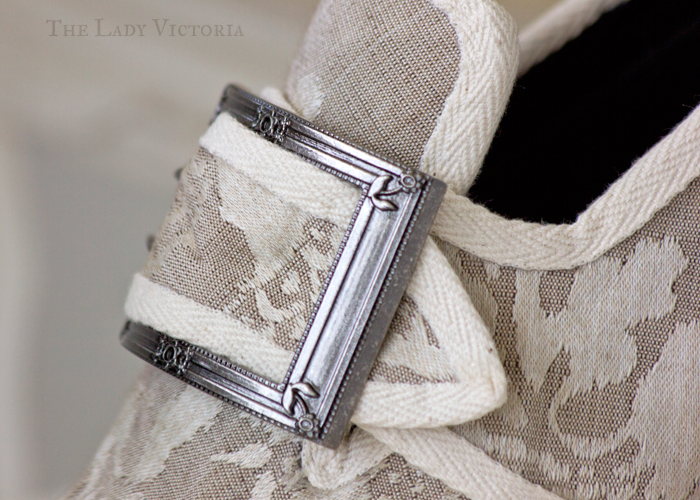 This also happened to be right where my pockets were, but I'll talk about that more in my petticoat post. The first few times I wore it tied around my waist, but that didn't look right to me. It meant that the petticoats sat above my waist, making my torso look short. For the photoshoot I tied it on my hips, looping the ties through the tabs on my stays. 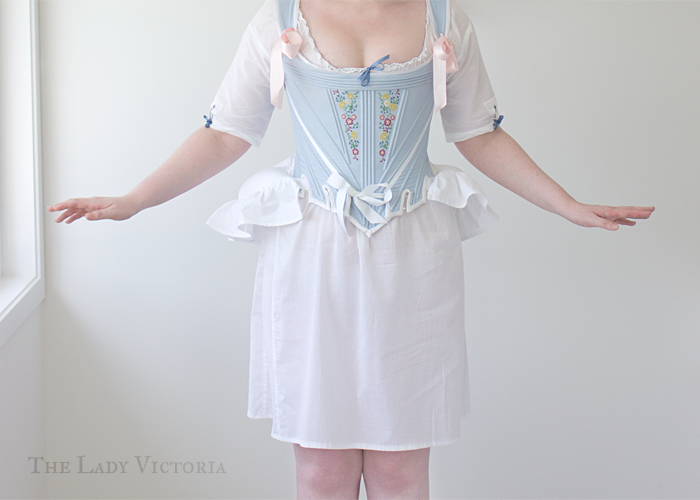 This let the petticoat waistbands sit on my waist, giving a much better silhouette. I'm really pleased with how this turned out, and it only took an afternoon or two to make.